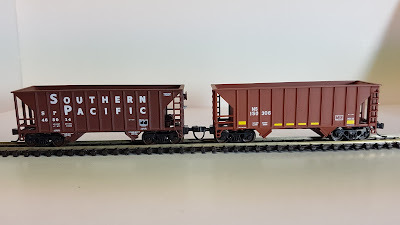 After a few light runs I managed to damage a few of the weak couplers on these wagons and I decided to replace them with much stronger Micro Trains trucks and couplers with metal wheels. 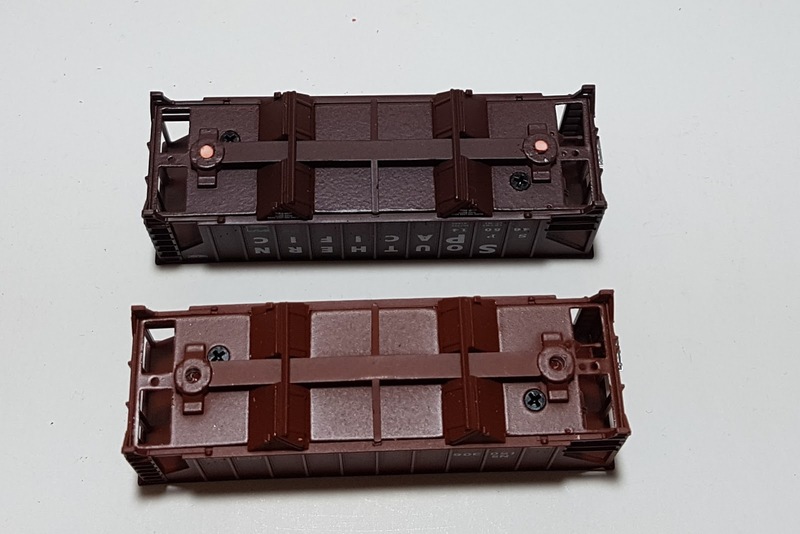 Going forward I will endeavor to replace all the trucks and couplers on other Wathers rolling stock I have I just did these first as I have a ballast plant on the layout and these wagons will do a lot of shunting. 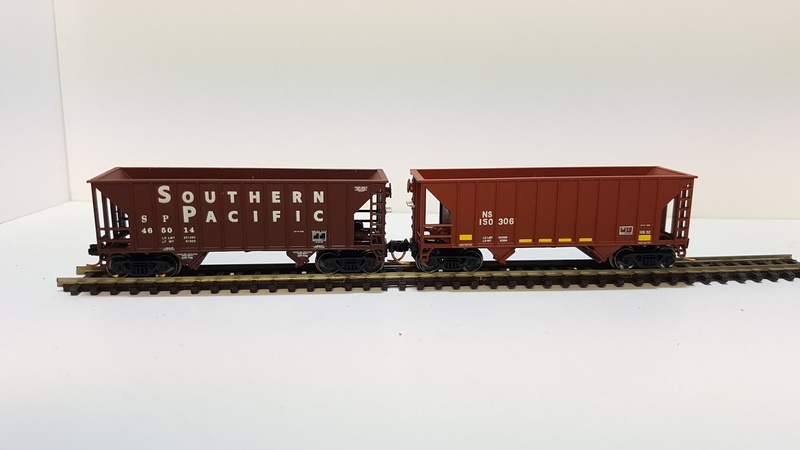 Original unmodified wagons as you can see there is quite a gap between the wagons when coupled. 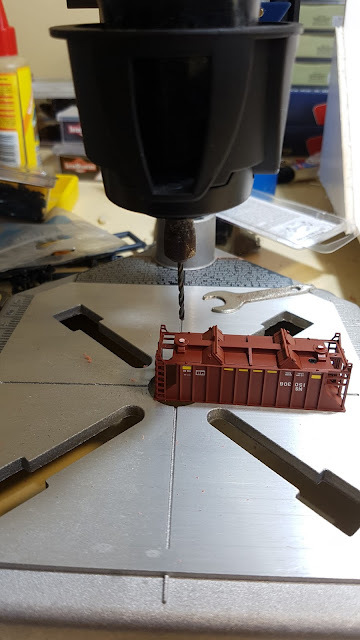 The original trucks are glued in and you will have to break the plastic pins by pulling off the trucks, I drilled out the remaining plastic with a Dremil mounted on a stand. 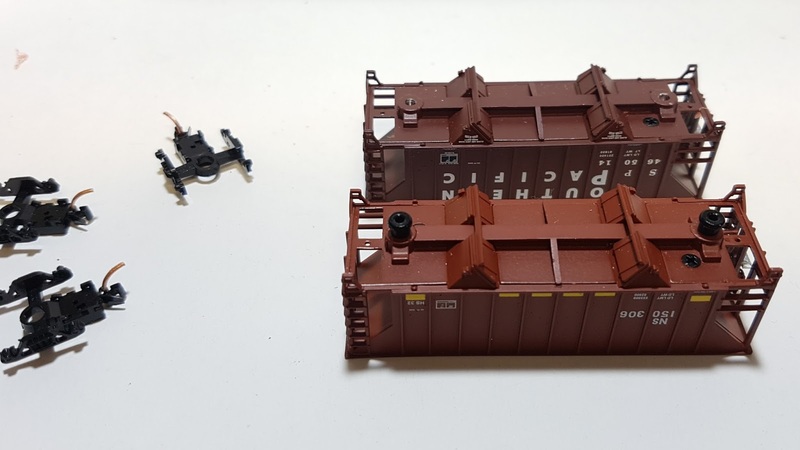 Before and after, there is a metal under frame that the pins are pushed into and it acts as a guide for the drill leaving a tight secure fit for the Micro Trains pins. My helper for the morning. 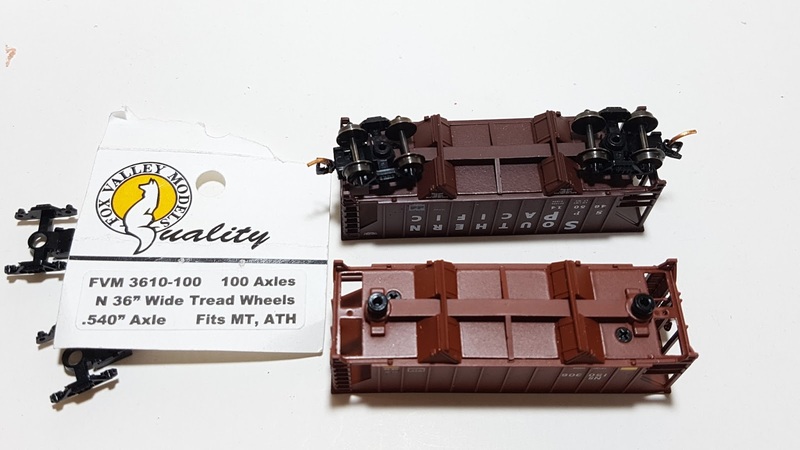 Fox Valley 36" wheels and Micro Trains trucks. New wheels, trucks and couplers and a lot closer together. 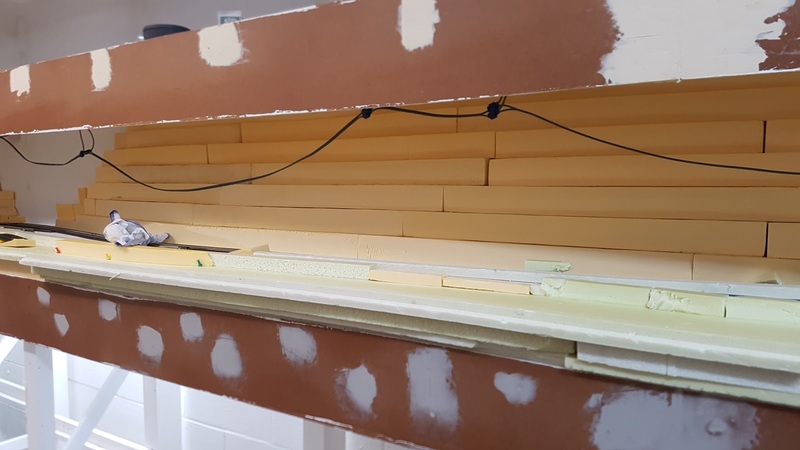 Wow it has been a year since the last update and as usual life has got in the way of the layout but I have been picking away at it. At the moment I am in the process of finishing off the track and wiring on the top deck including the remaining point motors and push rods for the manual throws. While doing this work I discovered two of the DCC Concepts switch motors had stopped working and another one was non-functional out of the box. 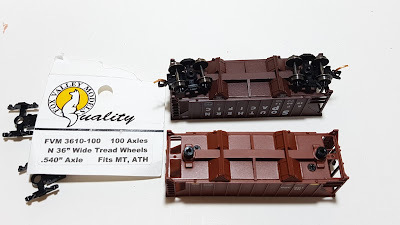 I have replaced these with some new upgraded ones I recently purchased and will put them in the storage yards when they get back. A very quick reply (within five minutes) to an email with a few things to try came from the office in Perth but to no avail and the offending items have been sent for repair or replacement. 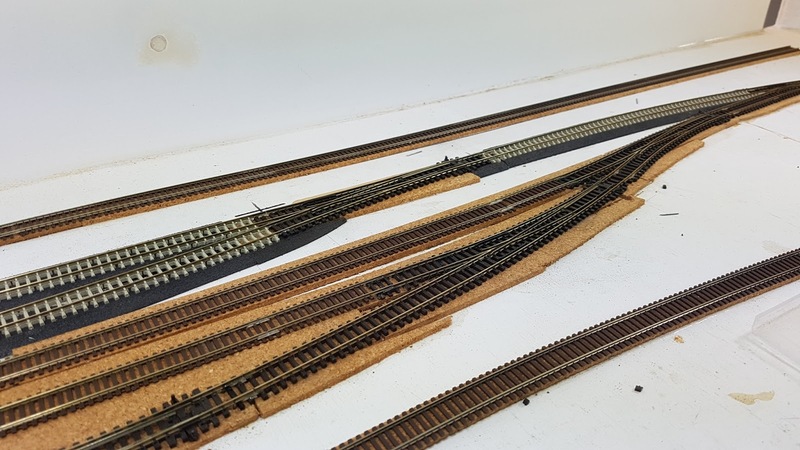 Most of the track work involves replacing sleepers under joins and feeder and securing the wiring underneath. The north end of the yard with point motors attached and sleepers replaced. 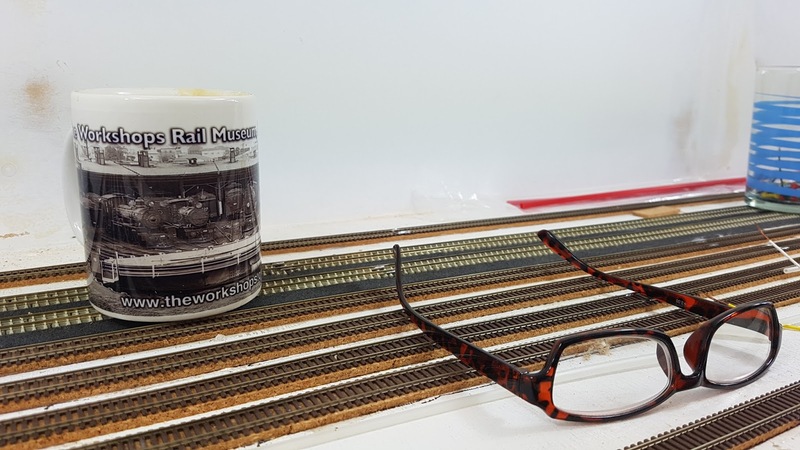 Working my way along the yard tracks replacing sleepers with my old man glasses. 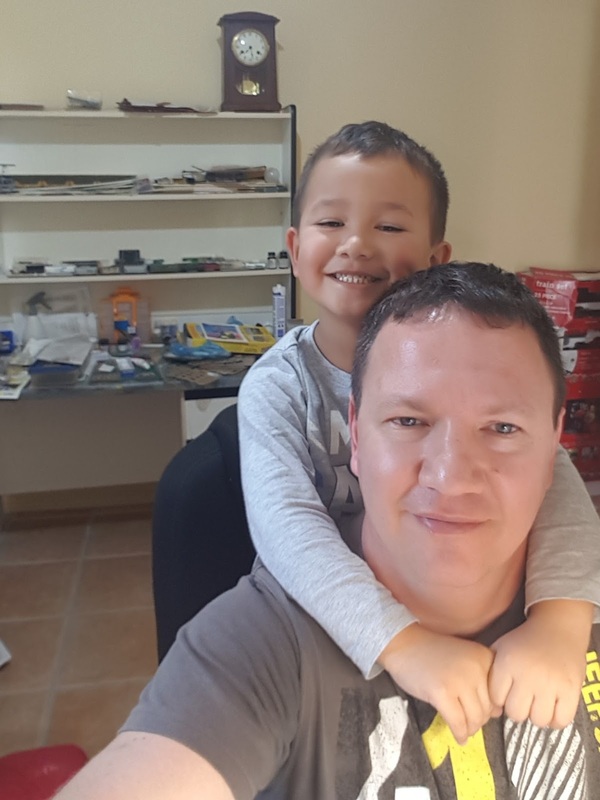 Waiting for dad to get the track done. 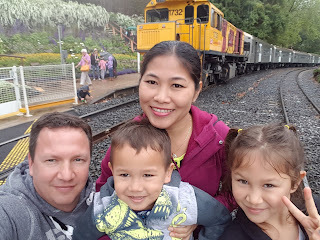 Some times you can combine train time and family time, this is us at the 2016 Carnival of Flowers in Toowoomba in front of the shuttle train from Toowoomba to Spring Bluff Station. 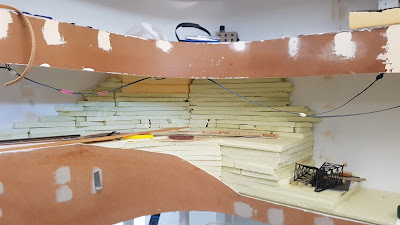 As I carve the foam I have come to the realization that I need to finish the steel bridge so I can carve the landforms around it. I have had these magnetic jigs a while and this is the first time I used them on such fine work as these bridge support towers. 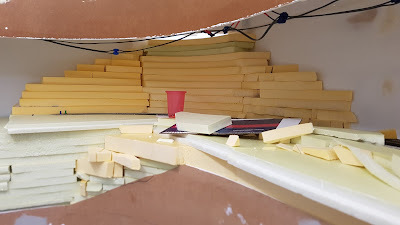 I have been quietly chipping away at laying the foam board for the scenery on the lower deck and it bores me more than wood working. I have also done the track for the crossing loop and the stone quarry as well. 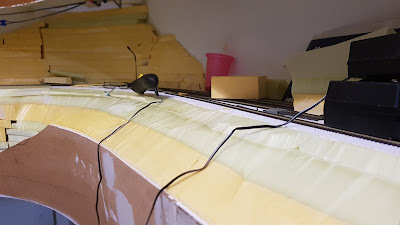 Once all the foam is done I will finish off the rest of the track and hopefully run some trains before the end of the year. 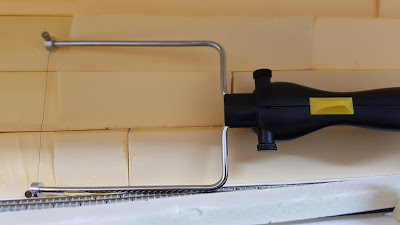 I have been useing a woodland scenics foam wand to trim the foam down. After relaying the Helix it is good to be working on the visible part of the layout again, at the moment I am placing the foam board for the scenery on the lower deck and plan to lay the track as well. 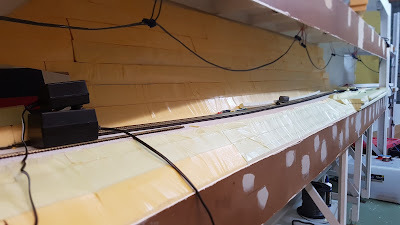 There are two bridges on the lower deck and I will use temporary track to fill the gaps and get back to them later. I want to do this so I can get some trains running and get the wiring and fascia done and clean up the construction of the layout. 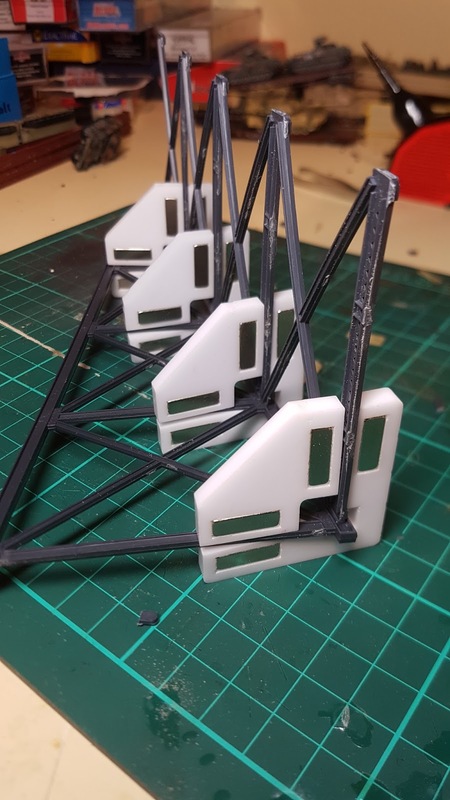 The first bridge will have three spans made from the excellent Kato single track truss bridges that I have acquired over the years the second will be a Micro Engineering steel viaduct bridge kit a bit over a meter long. Working out the track placement for the rock plant. 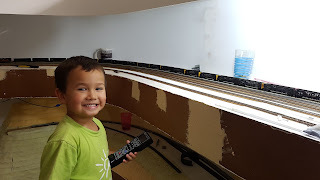 Working out the track arrangement for the crossing loop on the lower level. 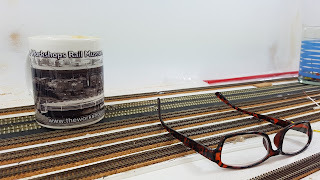 Well the helix track has been relaid with an extra track in the middle to turn or store trains as well as the lower staging and wiring done as well. 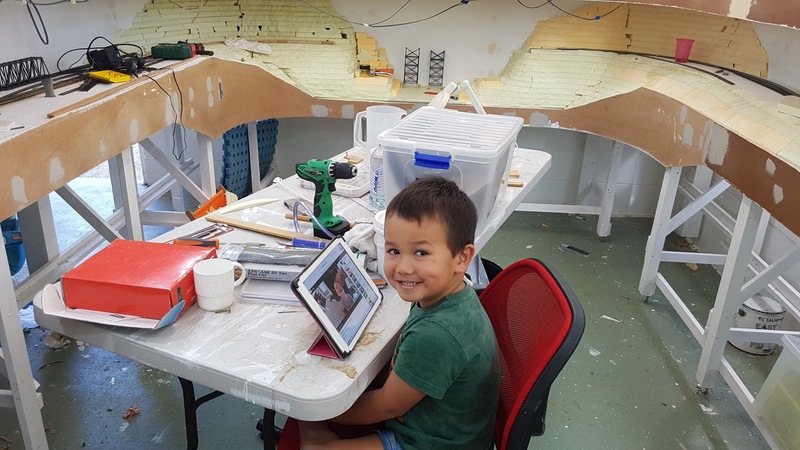 Nothing gives you more satisfaction as when you wire up the control and it all runs with no bugs, first time. Another thing I saw on the net and helped me alot was placing a bit of tape on one side of a wagon to keep an eye on the polarity of the tracks and as predicted through many badly drawn track plans the only change in polarity is the reversing loop in the middle of the helix. Not pretty but easy to repair or resolder just need to add some fall protection to the staging area. 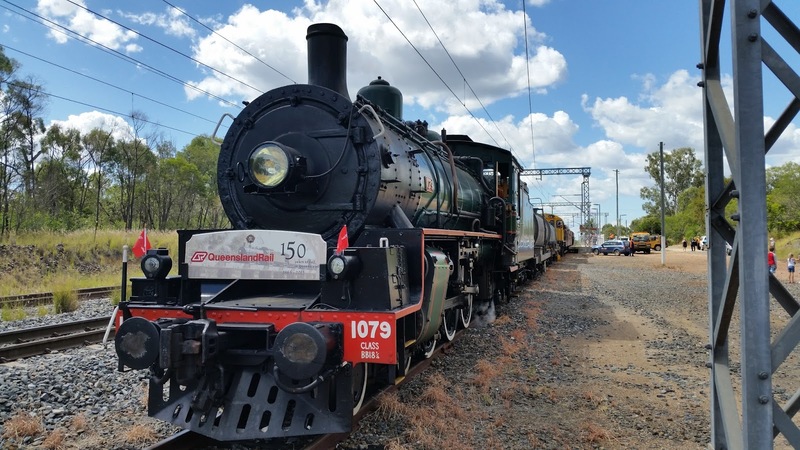 The Queensland Rail 150th Train was in the region during April as part of its state tour during 2015 and this section of the tour was covering Brisbane to Longreach and would return to Brisbane from Winton located to the north west of Longreach as a historical troop train re-enactment as part of the celebrations marking the 100th anniversary of the landing by Commonwealth Forces on the Gallipoli Peninsula in 1915. 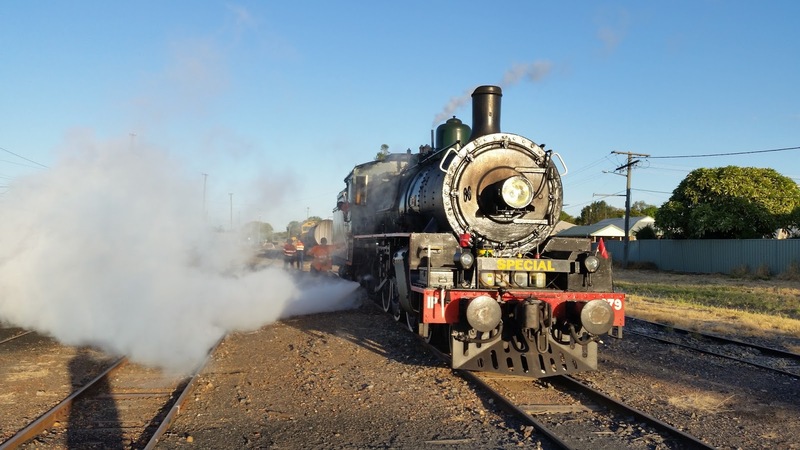 The trip up from Brisbane was done in sections and seats were available to the public at quite reasonable prices and the return run was a charter train and seats were sold as all inclusive packages with accommodation and events. 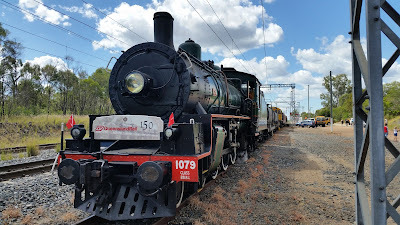 I chose to follow the Rockhampton to Emerald section of the trip on Tuesday the 14th of April and stayed in Emerald to catch the three short trips from Emerald to Taroborah which is about twenty kilometres west on the central line the next day. 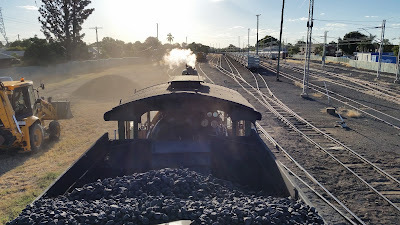 The train departed Rockhampton about five minutes late and my main focus was to get video of the train and photos a distinct second. The train had a diesel locomotive marshalled behind the two water wagons to assist the steam loco with maintaining the schedule and assisting it up the Gogango Range about sixty kilometres west of Rockhampton. 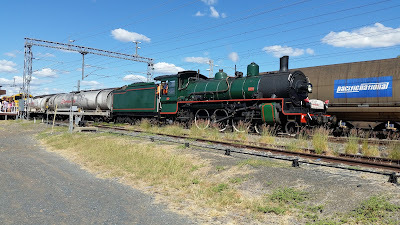 It also made the train a little more interesting to follow as the drivers used the whistle and horn to communicate but most of the run you hardly heard the diesel due to the sound coming from the steam loco. Being school holidays there was quite a few families waiting along the line but I didn’t see any other people following it all the way out to Emerald. 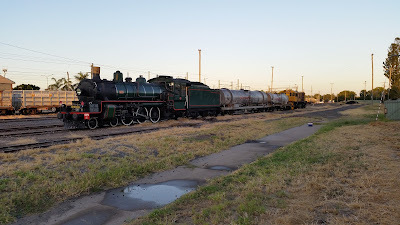 I did come across some amateur photographers closer to Comet and Emerald who had some expensive gear but no idea about light or composition by the look of it. The next day was a little different and I had the pleasure to meet some of the more advanced photographers in the area and we shared stories and tips and have even been able to see some of their photos on other sites and I will try and link to this blog. One young man even had a drone to film the train at Taroborah but unfortunately for some unknown reason it crashed after a few minutes. The photos with the # at the end of the caption were supplied by one of the drivers of the train, Adrian Nettlford. The second video features the runs out and back to Taroborah on the following day. 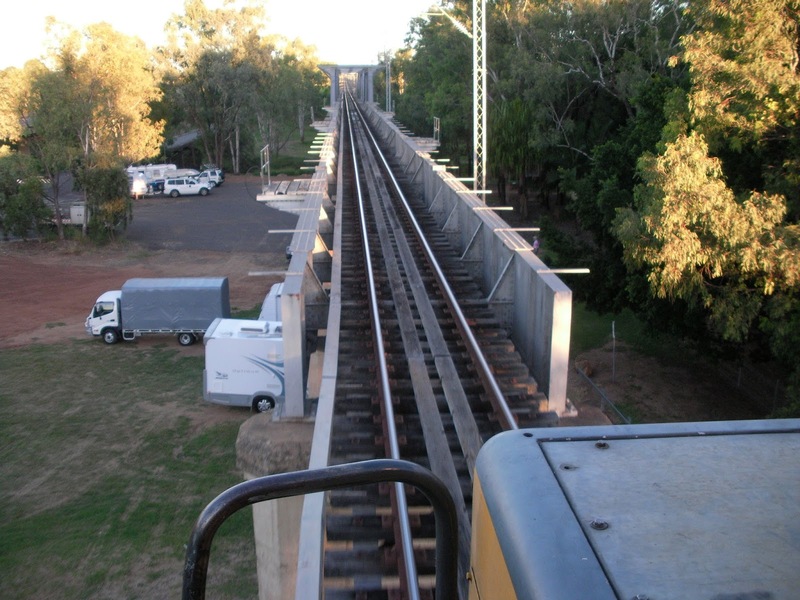 The train departing Rockhampton yard. After a service stop at Duaringa the train sets a cracking pace on the way to Bluff at Tryphinia. 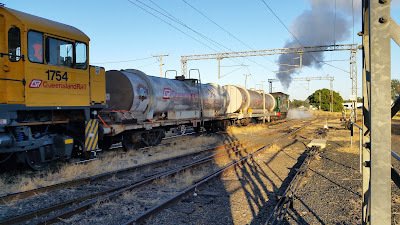 The train at the west end of Bluff yard approaching a red signal protecting a empty Aurizon coal train that departed ten minutes earlier. 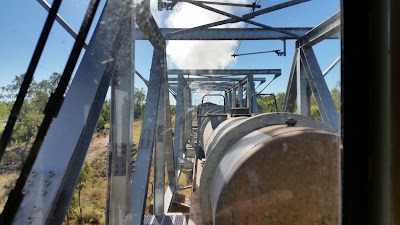 Crossing with a loaded coal train that has just departed the loading loop at Boonal. 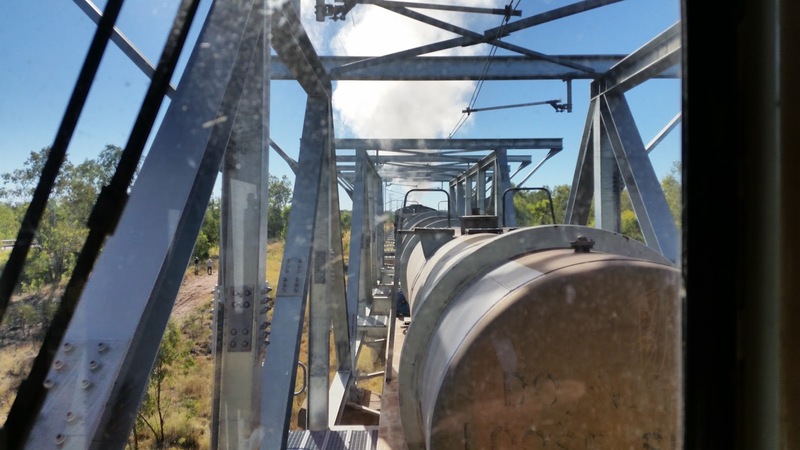 Station stop at Blackwater for a driver change. 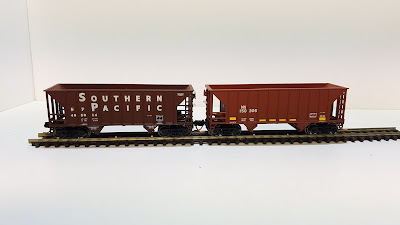 Departing Blackwater Station with an empty Pacific National coal set parked in the yard. Wasn't sure which one I liked the best so I put both of them in. Almost there crossing the Nogoya River in Emerald. 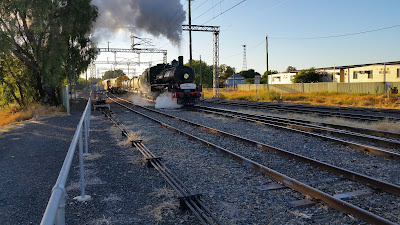 The next day on the 15th of April I went out early about 08.30 to find a location to catch the 09.30 arrival of the Spirit of the Outback from Rockhampton. What I didn't know was the train actually arrives around 08.45 to fuel the locos at the yards located on the eastern outskirts of Emerald. 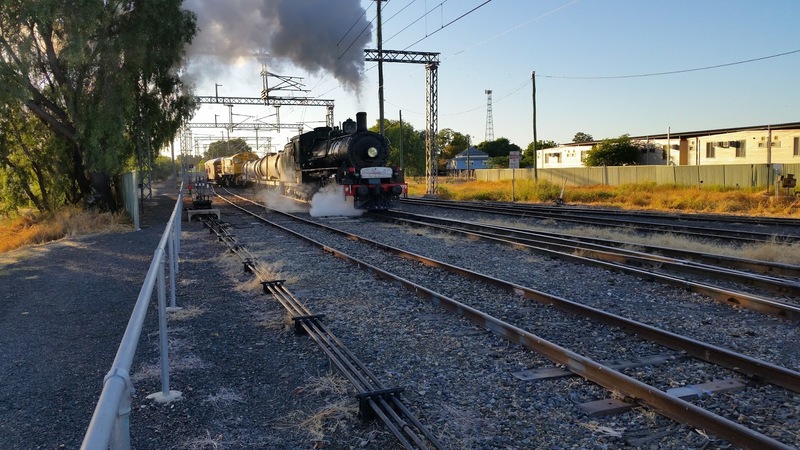 After refueling the Spirit of the Outback makes an on time arrival at Emerald as it crosses the Nogoya River. Emerald station yard after the Spirits departure, the staem train was stored out of sight behind the empty stock train. After pulling foreward then reversing into the platform road 1079 was the focus of attention while the families waited to board the train for the first short run of the day. On the second run of the day and just clear of Emerald Yard and back on jointed rails. This section of track featured jointed rail made in 1938 and a mix of steel and wood sleepers but looked very well maintained. 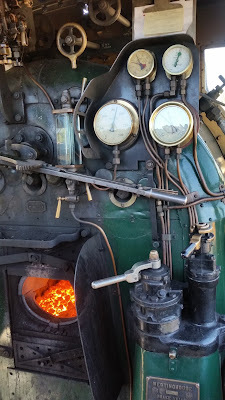 While the loco was uncoupling from the train on the second run some ash or cinders from the fire box started a small fire which the ever present fire tender quickly put out. 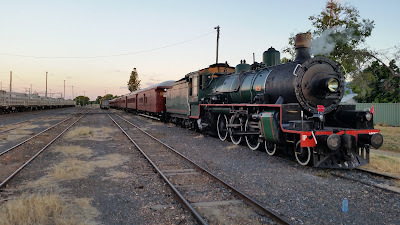 After running around the train the loco waits to depart back to Emerald with the ever present fire tender close by.